Bright wall color? Check! Better organization? Check! Trendy gallery wall? Check! Comfy and cute bedding? Check! Yep, thanks to Remodo and J-14 Decorate, Brec Bassinger has a brand new bedroom style that’s all her own. “I absolutely love my new room!” she exclaims. “I can’t wait for all of my friends to see it!” So how did it all come together? First, J-14 Decorate called up our friends at Remodo, an N.Y.C.-based company that allows shoppers to pick a theme from their super helpful boxed bedroom and gallery sets. Brec checked out their site and selected the Bon Appetit Seven and Haute Couture Three sets for her walls and the Refine Twin Boxed Room bedroom set. “I loved how easy the whole process was,” Brec shares with J-14 Decorate. “The fact that a simple box can redo your room is so fun and exciting. I love how it all came together!” Us too! Before Remodo combined Brec’s existing furniture pieces with their Boxed Room items, her room was pretty boring. “It didn’t have much color,” Brec admits of her old space. So J-14 Decorate and Brec chose the perfect shade of lavender to paint the walls. The end result? Totally amazing. Check out Brec's room makeover below! The Bella and the Bulldogs star lives with her mom in Sherman Oaks, CA, while she’s filming projects. Her dad and two brothers live full-time in Texas, where she’s from. Organization is a top priority in Brec's bedroom. In the storage bins, she keeps chargers and books. Underneath her bed, she has more clothes! Thanks to these eye-catching and beautiful images from Remodo’s Boxed Set, Brec’s walls were given a total facelift. “My walls after the redo have more ‘pop’ to them!” she tells J-14 Decorate. “My space now has more funk and the pictures really brought the room to life.” We heart the chic pineapple! And on another wall, Brec displays some of her favorite photos! So who designed Brec's space? None other than Amanda Fox, Remodo co-founder! Amanda was just 25 when she launched Remodo. “I was young, but it was exciting,” she tells J-14 Decorate. Although some people doubted her, the New Yorker (who studied business and communications in college) has the last laugh. Besides redecorating Brec’s room, she also redid Debby Ryan’s bedroom in 2015 — and Remodo is thriving. "Growing up, my sister and I realized at a young age how important it is to have your own space. We conceptualized Remodo a couple of years ago since friends were asking us the same question: 'What is the best way to redecorate your space affordably and efficiently?' After sending them links to multiple sites to find cute bedding, decorative pillows, and picture frames, it dawned on us to create customized decor sets, conveniently delivered to your door. And thus, Boxed Rooms was born. We spent months creating the perfect designs!" she said. When asked about what it was like redecorating Brec's room, Amanda said, " Beyond enjoyable! Brec could not be sweeter and was very involved in every aspect of her room. She keeps it very clean and has multiple personal touches throughout her space." Amanda also spilled her tips for budding interior designers. She said, "There is a huge network out there for you to lean on. Utilize it and ask for help and advice! Starting a business or becoming a well-known designer is challenging and success does not happen overnight. Interning is a great place to start. Most designers I know eventually hire their interns. Having small goals with realistic expectations are vital!" 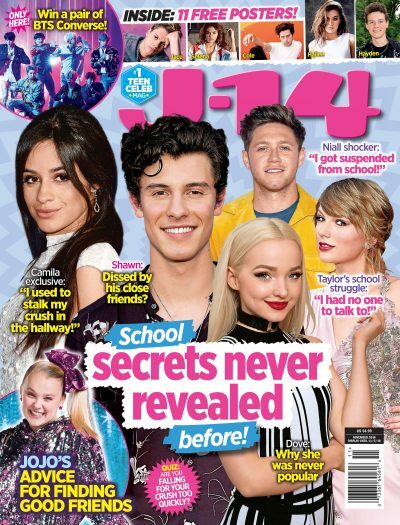 This feature originally appeared in the September 2016 issue of J-14 Decorate.